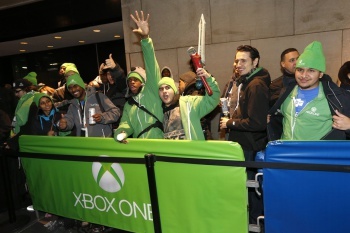 At peak demand, customers were ordering the Xbox One at over 1000 units per minute on Amazon.com. If you followed the pre-launch coverage of Sony and Microsoft's newest machines, it would be a safe bet to assume that the PS4 would outsell the Xbox One by a considerable margin, based on all the negative news surrounding Microsoft's console, as well as its higher price point. But it's turning out to be a closer race than most expected. Earlier in the month, Sony announced it had sold 2 million PS4 consoles, and now, Microsoft's Larry "Major Nelson" Hyrb has stepped up to announce that the Xbox One also sold 2 million units in it's first 18 days. When the consoles were first released, both Microsoft and Sony were keen to announce that they had each sold a million units within 24 hours. Critics pointed out that the Microsoft figure was for 13 markets worldwide, whereas the Sony figure was solely from North America. However, now both systems have launched in most major worldwide markets, and both companies are still neck-and-neck. It's worth noting that neither console has launched in Japan as of yet, a region that Sony has traditionally dominated.